Why I'd love to come to dinner! 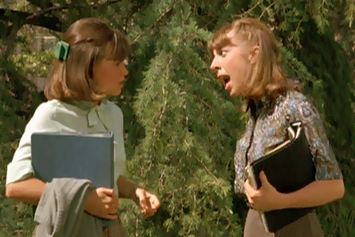 I'll just get my "Seventeen Magazine Book of Etiquette" out for a few dining tips. 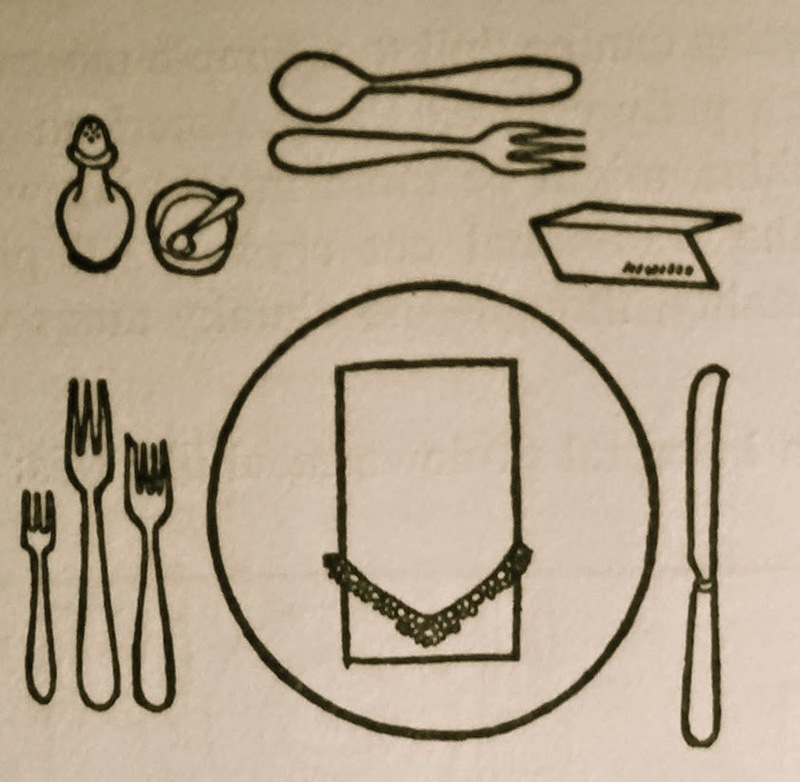 Depiction of a typical place setting for a more formal dinner. Wait 'til a few others have been served before starting. When you are a guest, take your cue from your hostess; some families say grace before a meal. Mind her, though, if she says "go ahead" and don't wait for her. A napkin goes on your lap unless you tuck it in under your chin at a spaghetti or lobster feast. When you leave the table, deposit it at the left side of your plate; the only time you fold it is when you're given a napkin ring. An explanation and depiction of flatware one may find at a dinner. You sit up straight, with the chair pulled into the table. You'll look better and the food won't dribble on your clothes or the floor. Fidgeting spoils the appetite (the other fellow's). Stop it if you find you're carving patterns on the tablecloth with a fork, fiddling with the silver or running a finger idly around the rim of your glass. If you're not sure which fork to use, eye your hostess. Most tables have the silver set from the outside in, toward the plate, in the order in which it will be needed. Many restaurants put every piece of silver they can find at each place; that's when you have to take your chances. Most people will just think you're absent minded if you take the wrong implement. Food stays pretty much at plate level until you're ready to put it in your mouth. Hold bread close to the butter plate when you break and butter it. Elbows stay at table level even if the meat is tough to cut. You don't reach across anyone else's place. "May I have the salt, please?" is the way to get it. If you drop an implement, leave it on the floor until the meal is over. If you're in a restaurant, you don't pick it up at all. "It's a nice idea to pat your mouth with a tissue before drinking out of a glass; it avoids unaesthetic smudges... At least that's what the book says." Any glass with a stem is held by the bowl for better balance. Otherwise it might wobble and spill. It's a nice idea to pat your mouth with a tissue before drinking out of a glass; it avoids unaesthetic smudges. The long spoon served with iced tea, a soda or a milkshake goes in the saucer when you're not using it. No saucer? Leave the spoon in the glass and brace it with your forefinger when you drink so you won't jab your eye. Mouths are zipped up when chewing. Soup is not slurped. Teeth are not clicked noisily with spoons. Only puppies are cute smacking their food. Follow pattern of host or hostess before you pick up drumstick or chop bone. Some people do. Some people don't. Learn to answer a question neatly when your mouth is full. But not too full! Food should be cut to manageable size -- one piece at a time. A plate of minced-up food looks right at a toddlers place, not at a teen's. You sit up straight with the chair pulled into the table. You'll look better and the food won't dribble onto your clothes. Butter and jelly are never spread on a whole slice of bread or toast. Break, butter and eat is the order. For rolls, too. But you'd probably break and butter all the pieces of a hot popover so the butter would melt nicely. If there is no spoon for the salt dish, use the blade of a clean knife. Choking a little? Take a sip of water -- or leave the table 'til you've recovered. When a platter or dish is served to you, use the serving fork to steady the food and a serving spoon to lift the food to your plate. Then replace the fork and spoon, side by side, so handles stay clear of food. Take small portions; you're almost sure to get a second chance. When a serving dish is passed around the table, hold or steady it for the next person. Hand a pitcher with a handle pointing towards receiver. Put sandwiches and other finger foods on your plate before eating them. Implements you have used never go in dishes others will share -- your spoon in the sugar bowl, as an example. 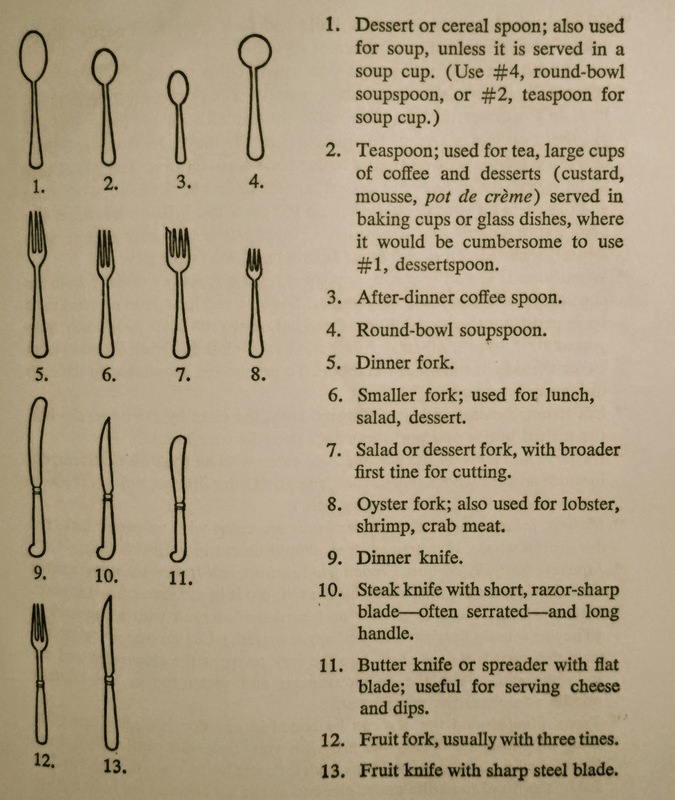 If you see an implement in a dish, use it instead of fingers -- a pickle or lemon fork, sugar or ice tongs, nut spoon. Never leave a spoon in the coffee, egg or soup cup or in the dessert dish. Rest it on the saucer or plate beneath. 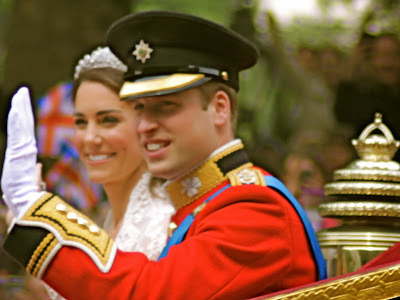 When you pass your plate for seconds, or when you've finished, place the knife and fork, the spoon or fork, or the dessert spoon and fork side by side on the plate -- so the handles rest on the rim and the tips are in the well of the plate. That keeps the silver from bouncing off.